The first phase of the huge Khazar Islands project will be completed in May this year, Azertag state news agency cites Avesta Company. 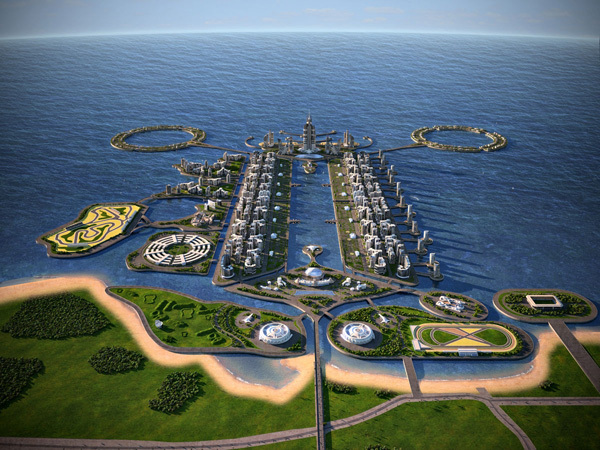 Khazar Islands, which is under construction on an artificial archipelago, will consist of 50 islands of different size with a total area of 3,000 hectares on which 19 residential districts will be built. According to the company, the opening of a number of facilities, including beaches, restaurants, bridges and roads, are scheduled for May 28. Besides, four km boulevard and two parks of 5 hectares for each will be put into operation by the mentioned time. The project will be implemented in three stages. The total investment required in the Khazar Islands project is estimated at $ 100 billion. In general, it is planned to construct 20 km boulevard and 20 bridges. The tallest building on the planet, the 1,050 meter-high Azerbaijan Tower, will be built in the territory of Khazar Islands as part of the second phase of the project. The Tower construction is expected to cost $2 billion. The completed Khazar city will have more than 150 schools, numerous hospitals, and clusters of parks, shops, and cultural centers. A yet-to-be-constructed airport will provide international access to the area. The islands will be dominated by high-rise buildings and resort-like accommodations, with miles of unspoiled beaches and warm, shallow waters. Special considerations were taken in the design of the island's structures to withstand up to a 9.0 magnitude quake.